Cassandra is a project that wants to change the way of interpreting company. For the first time you will have the opportunity to become part of the birth and development of investment ideas and at the same time benefit earnings generated by these. Thanks to the signing of a package of participation you can see your little savings turn into great investments becoming partner of the company. 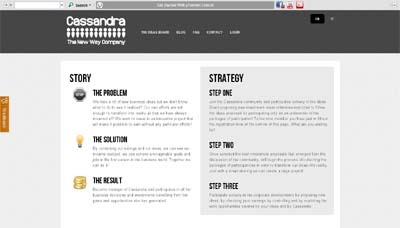 In a world where the only way to take part in the business decisions is to be “a millionaire” owner of shareholdings so large to influence all the management choices, Cassandra offers to anyone who becomes part of her community the opportunity to actively participate in corporate decisions and at the same time to benefit from the profits generated by these.